Increases were especially high in romantic wedding destinations—such as the coastal counties of Santa Cruz (118%), Monterey (42%) and Ventura (42%), the Bay Area (Alameda, 52%, Marin, 86%, San Mateo, 46%), and wine country (Napa, 44%, Sonoma, 52%)—but also in more rural and historically conservative areas such as Amador (7)%), Colusa (167%), Nevada (46%), Riverside (62%), and San Bernardino (41%) counties. The state does not track the demographic information of people applying for marriage licenses, including gender, but it’s safe to say that a large part of the surge is due to the large number of gay and lesbian couples in the state who were waiting to tie the knot. Couples have 90 days to get married after they obtain a marriage license. 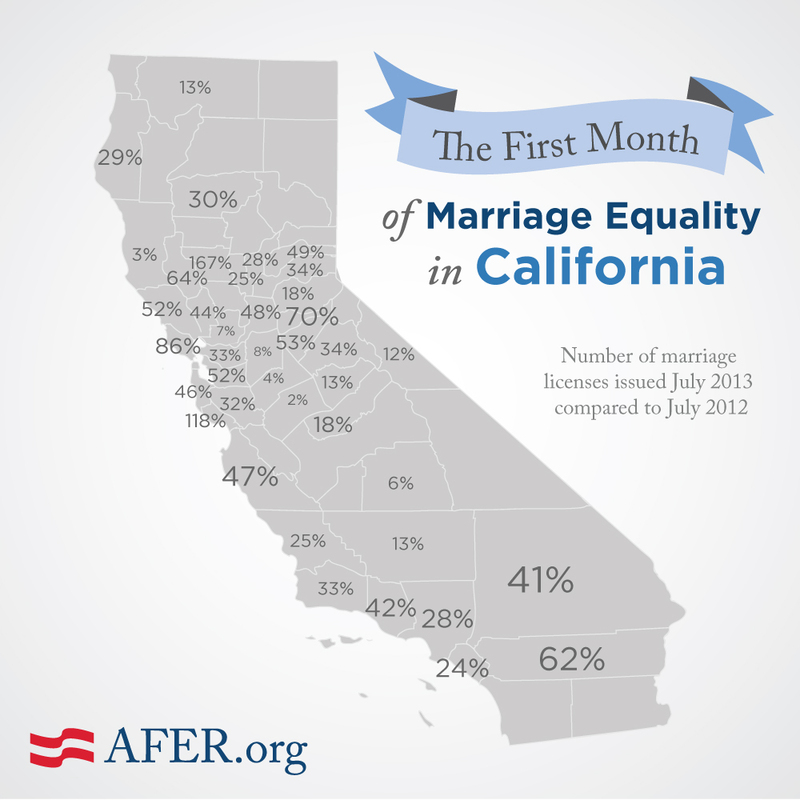 AFER collected the unofficial data from 50 of California’s 58 counties. Official data is expected later this year. The UCLA Williams Institute estimated in 2008 that allowing gay and lesbian couples the freedom to marry would boost the state and local economy by $63.8 million over three years. If you’ve gotten married, or plan to, tell us your love story and visit our wedding resources.